The House Pala Luar is located in a small valley near a stream of the river Cávado. It consists of two modules: House of Carvalho-Alvarinho and House of Azevinho. The architecture is simple and follows a smoothly throughout the surrounding space. The land, consisting of a dense forest of indigenous trees, is situated in a secluded location offering calm and privacy needed for a few days rest. The main facade of the House of Carvalho-Alvarinho, where is located the living room and two bedrooms with large windows, allows direct access to the garden, pool and deck with a view over the river. This being the main house has the living conditions for all guests with a very comfortable and wide lounge. It has three bedrooms: two double and one twin. The House of Azevinho is more a home support and consists of two bedrooms (one double and one twin), living room with sofa-bed for two and kitchenette. It is located a little further down the House of Carvalho-Alvarinho along the small creek that borders the land. It´s very near of the Peneda-Geres park where you can enjoy all kinds of activities in the unique and magnificent National Park in Portugal. Pala Luar est vraiment la maison de vacances idéales, surtout pour une grande famille. Avec ses deux maisons séparées, elle offre l'intimité nécessaire à de belles vacances. Et que dire des prestations ? magnifiques et conformes à la description du site web. Les maisons sont tellement agréables qu'on s'y sent tout de suite chez soi. Au point que nous n'avons pas trop visité la région (que nous connaissions déjà) tellement on était bien dans la maison et sa grande piscine (12x5). Nichées dans cet ilôt de verdure surplombant le rio Cavado, elles offrent une fraîcheur idéale pour supporter la chaleur. Merci à Joao et isabel pour l'accueil, et à M. Viera pour son miel ! La estancia ha sido perfecta. Mucho mas que una tipica casa de turismo rural. Equipamiento al maximo, vistas preciosas, cuidadisimo entorno dentro de la propiedad. 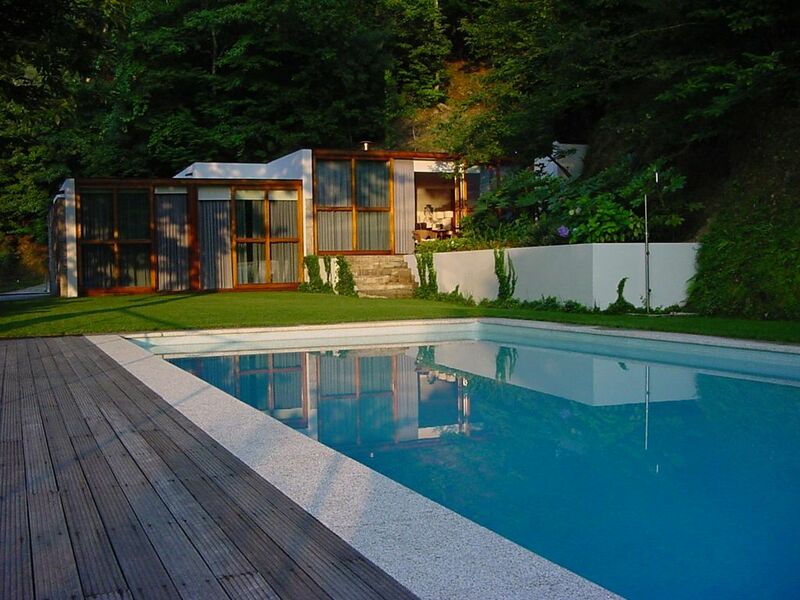 The house is located near the only national park in Portugal - the Peneda-Gerês. A five minutes walk it´s Cávado river and access to beaches. The house overlook the river and is surrounded by a dense and diverse forest comprised mostly of chestnut, oak, ash, walnut, etc.. Near the House Pala Luar (10 minutes by car) you will find a playground with Marina, where you can enjoy various activities in the river and find many typical restaurants. In Peneda-Geres National Park you can do some of the recommended tracks and know more about one of the largest reserves of fauna and flora of Portugal. Os preços incluem duas casas. Períodos como Passagem do ano, Natal, Páscoa, Carnaval e S.João - preços sob consulta. É exigida caução por reserva de 500€.